What do you know about the current initiatives for ELCA World Hunger? How do you currently receive info about ELCA World Hunger activities? You selected Other; please describe. Not receiving info now or would like to make sure you don't miss anything? How would you like to receive info about ELCA World Hunger activities? If different that your email address listed above, please provide your preferred email address for communications regarding ELCA World Hunger. Please provide your preferred mailing address for communications regarding ELCA World Hunger. If different that your phone number listed above, please provide your preferred phone number for communications regarding ELCA World Hunger. Please provide your social media account(s) where you would like to connect with ELCA World Hunger. What involvement have YOU had with ELCA World Hunger in the past? Please provide as much detail as possible. What involvement has YOUR CHURCH had with ELCA World Hunger in the past? Please provide as much specific info as possible. Example: Sep-Oct 2016. Paper for Water project. Raised $6,000 in 6 weeks! We gathered 500 lbs of paper to be recycled. 3 churches participated: Central, Dallas, Mt Olive, Dallas, St John's, Dallas. There were 45 people involved in total, including pastors from all 3 churches: Pounds, McCann, and Harris, respectively. Lay leaders were Anne Monson (Central), Carlos Santos (Mt Olive), and Sandra Tippett (St John's). ELCA World Hunger gave a workshop to get us started and worked with us throughout the project. We worked with Iain Chester from ELCA World Hunger, Chicago office. Does your congregation's annual budget include a line item for ELCA World Hunger? Has your church received a grant to do an ELCA World Hunger project? Please provide as much detail as possible. Is your church planning any projects that might qualify for a grant from ELCA World Hunger? Please provide as much detail as possible. Grant applications close in July. Please include contact info for the best person on your team to contact regarding your application. 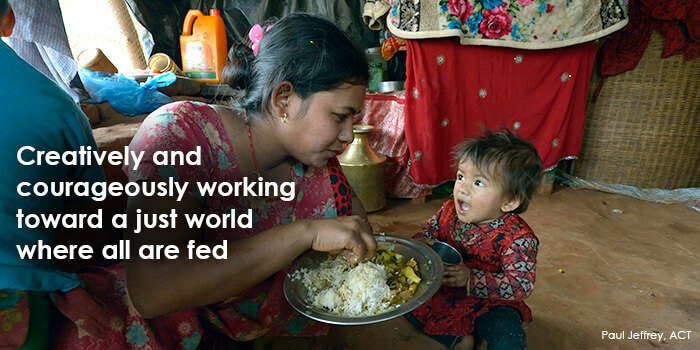 What sort of World Hunger project(s) are you passionate about? What project(s) do you think would generate the most interest and create the widest participation in your congregation / community? Does your congregation participate with any other churches or community feeding/hunger programs? If so, please describe. Are there other churches and/or organizations in your area to make combining efforts effective? Please list partner churches / organizations and provide contact info, if possible. In addition to you, are there other people to contact to get a World Hunger program started in your church / area? Please provide their name, contact info, and home church & city, if possible. Would your church be interested in receiving World Hunger training?